PORTLAND, Me. 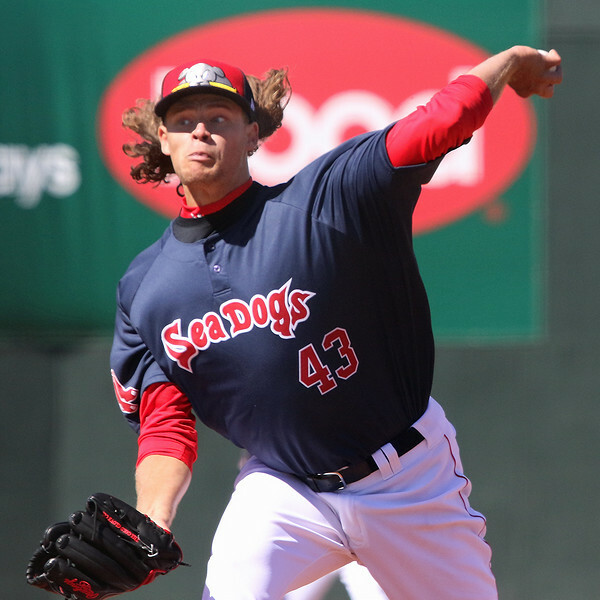 -- After repeating High A Salem in 2016, Trey Ball took the mound in the season’s third game for his Double-A debut as the Sea Dogs took on the Reading Fightin Phils at Hadlock Field. Here’s The Write-Up on his start. Line: 5.1 IP, 7 H, 4 ER, 2 BB, 1 HBP, 6 K; 84 pitches, 52 strikes (62%); 12/24 first-pitch strikes (50%); 10 swing-and-misses. Ball has a tall, lanky frame with long limbs. He was listed at 175 pounds in the 2013 draft out of high school, so he’s put on roughly fifteen pounds of lean muscle with room still to grow. He comes set with his hands at shoulder height and his glove in front of face. He takes a short step back and the hands remain in place as he turns into his delivery with a high leg lift and stands tall over the rubber on his posting leg with good balance. As he drives off the rubber towards the plate and the hands break, his front elbow goes up and he hides the ball behind his back leg. He has short arm action and average arm speed. He gets over his front side and lands balanced in a good position to field. Ball featured a five-pitch mix in this outing: fastball, cutter, curveball, slider, and changeup. Ball’s fastball was 88-93 mph, mostly sitting at 88-91 mph. The pitch is fringe-average, showing both straight, four-seam action and sinking, two-seam action. He also has the ability to cut the fastball at 85-87 mph, and he threw the pitch frequently this outing as well as his slider at 83-86 mph. The slider generally had longer tilt, and Ball threw a few that flashed future bat-missing ability both to left-handed hitters and down-and-in on a right-handed hitter’s back foot. In total, Ball picked up 9 of his 10 swing-and-misses (by my count) with his cutter or slider, as it was tough to distinguish between the two pitches at times. The changeup was 80-84 mph and he showed the ability and confidence to throw it for a first-pitch strike. He rarely threw the changeup to right-handed hitters in this outing—a typical use of the pitch, throwing it away to batters of the opposite handedness—and elected to instead to focus on throwing a heavy dose of sliders and cutters breaking in on the hands of those hitters. When I saw Ball pitch again in Portland on April 23, he threw more changeups both generally and to right-handed hitters. The changeup was actually his best secondary in the latter outing, showing late fading action down-and-away to right-handers, and he picked up four swing-and-misses with the pitch. The curveball was a clear fifth option in his season-opening outing. He threw it sparingly at 72-73 mph with average 1-to-7 break at its best. He threw a heavier dose of curveballs in his third outing in the 73-76 mph range, and he showed the ability to throw it for first-pitch strikes. Overall, Ball still very much appears to be a raw, 6-foot-6 left-hander with an athletic delivery and ability to throw five different fringe-average grade pitches. In my opinion, Ball tries to do way too much with his five-pitch mix and doesn't appear to have any real plan of attack. I believe he would be better served simplifying things and focusing on developing fewer pitches, working with, say, a three-pitch mix. The slider showed the most promise and potential to miss bats in his initial outing, whereas the changeup showed better in his subsequent outing on April 23. Despite the promise of those two pitches, Ball’s lackluster fastball and overall fringe command profile will limit his upside and ability to miss bats at the Triple-A and major league level. Entering his fifth year in the system, Ball still won’t turn 23 years old until June. On the surface, Ball is still the raw, projectable lefty the Red Sox drafted with the #7 overall pick in 2013—which is not necessarily a good thing after three-and-a-half years of development. His realistic ceiling at this point is as a back-end, #4/#5 starter. However, given how slow his progress has been to date, it's fair to question if that projection will ever materialize. Photo credit: Trey Ball by Kelly O'Connor.